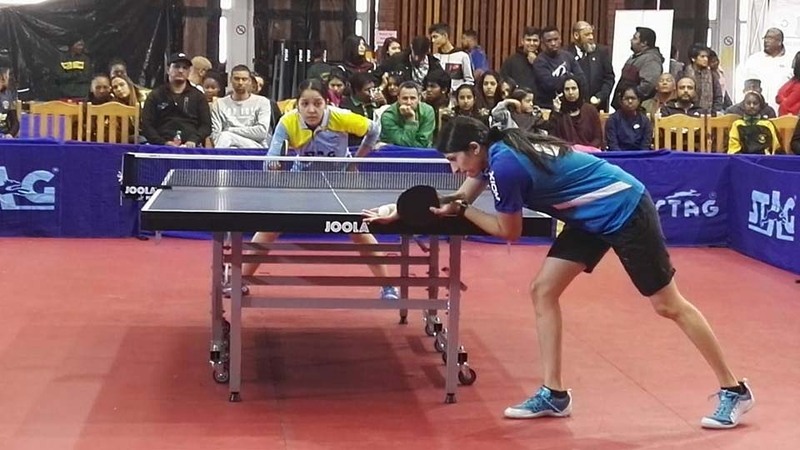 Organised for the first time by the Mpumalanga Table Tennis Association; after seven days of intense competition, play in the 2018 South African National Championships came to a close in the Secunda Ukhozi Lodge on Saturday 30th June. A full schedule, in addition to Men’s Singles and Women’s Singles events, competitions in the Under 13, Under 15 and Under 18 age groups were held. Furthermore there were surprises, no more so than in the Men’s Singles event; nine times champion Shane Overmeyer was beaten at the final hurdle by Kurt Lingeveldt who,by emerging successful, secured his second such title. Success for Kurt Lingevelt, in the corresponding Women’s Singles event it was success for Danisha Patel; in the title deciding contest she accounted for Simeen Mookrey. Impressive performance but it was very much the younger players who caught the eye. Cade Peters won the Under 18 Boys’ Singles title with the counterpart Under 18 Girls Singles event being secured by Lekesha Johnson. Impressive performances it was the same from Refai Yaghya and Kiara Naidoo who were crowned respective Under 15 Boys’ Singles and Under 15 Girls’ Singles champions. Meanwhile, in the Under 13 Boys’ Singles competition, Nur Van Wyk secured gold, whilst the top step of the podium in the Under 13 Girls’ Singles event was reserved by Kailey Anne Reddy. Most certainly the results and the outcome of the tournament in general, pleased Joe Carrim, the President of the South Africa Table Tennis Board. A successful tournament and to some extent it was a ground breaking event. Now the event over it is time to look forward. Impressively some 650 players competed in the South African National Championships.